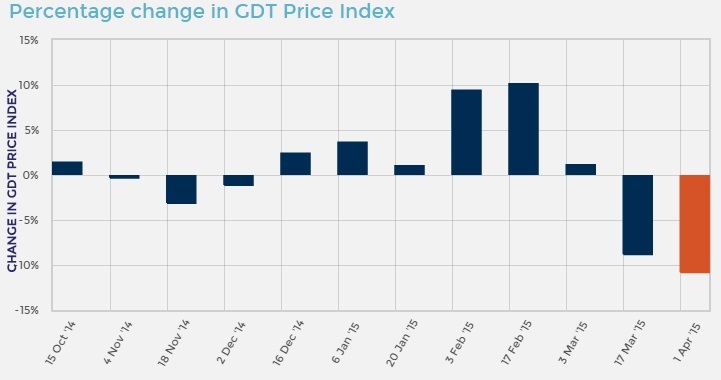 Dairy product prices have fallen significantly again at the most recent Global Dairy Trade (GDT) auction. The event represents the second negative auction for prices in 2015. Average prices paid at the dairy auction fell 10.8% on the last event held two weeks previously which was down 8.8% on February returns. A fall had been anticipated as Fonterra announced last week that it is set to increase the volume of product it puts up for sale on the GDT platform. 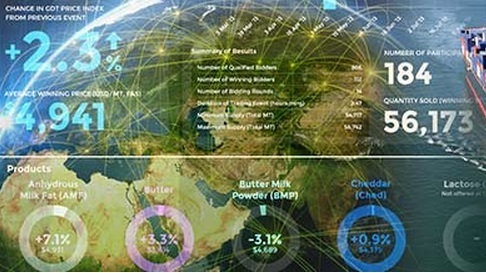 Fonterra increased the amount of whole milk powder (WMP) it will offer at the auction in Contract 2, which covers product with a June shipping date, by 14% to 4,965t. On the back of the announcement, WMP futures for June delivery dropped US$230/t to US$2400/t last week.